If necessary, select the desired organization. Apply the basic or advanced filter to the Member List page to narrow down your list to a select group of members. The filters enable you to create a select list of members. If you do not set up any filters, all of your members will be selected. 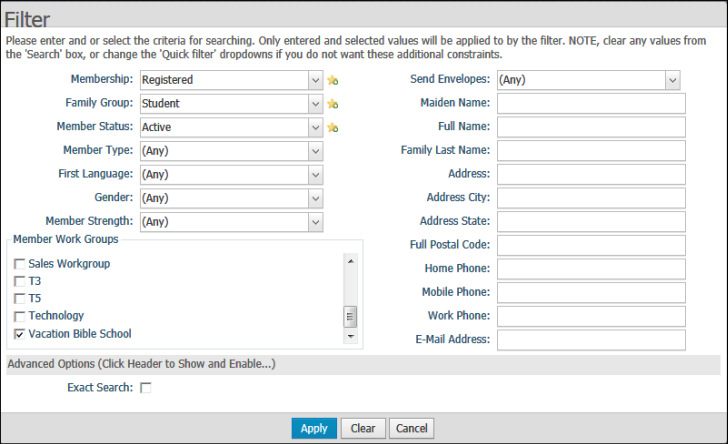 For help using the filters, see How to filter records. 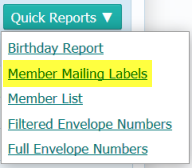 Click the check box next to the "Member Last" column heading to choose all members in the filtered list. The Report Viewer opens to display your labels. You can print your labels or save them to disk. For details, see How to Print, View, and Save Reports.